Are you surviving or are you thriving? Can you shoot a person who has abused your child? A salesman and loving father snapped at the magnitude of what happened to his son who was sexually assaulted by his karate instructor, Jeffrey Doucet. On Friday, March 16, 1984, while authorities were escorting Jeffrey Doucet through the airport a man lifted his gun out of nowhere and shot Doucet at point blank range. That man turned out to be Gary Plauche, the farther of the boy who was sexually abused. The judicial system exercised leniency with Gary Plauche by giving him a suspended sentence and probation. He didn’t spend one night in prison for what he did. I can’t help but wonder, 25 years on if this father would “get away” with it now. But then, what is getting away with it? Why do some people react the way this farther did? What is the right punishment for those who sexually abuse other humans? These questions are constantly on my mind. I feel certain that if we could find a right punishment allot more abused people would be able to accept and move on and allot more perpatrotors would be able to take accountability for there actions and move on. But, we’re stuck when we find out about these secrets. Families, friends, authorities, all not quite knowing what to do next. I think it’s half the reason it’s not spoken about or it gets avoided, but we have to talk, we have to keep asking the difficult questions. Can’t recall which podcast I heard this phrase but it’s been bounding around in my mind for weeks – The unthought known. To me it goes a long way in describing what we think but don’t have words for, or what we don’t think but do feel, and still don’t have words for. As I started to search for more information I came across a Perl Jam song with the same title and was struck by these words. I’m a long way off thinking this through fully but I’m sharing it cause it’s so profound to me. For most of my childhood I did not have words for my feelings, I still find it hard but I just love it when I learn something that describes what I’ve not been able to describe simply. “At its most compelling, the unthought known stands for those early schemata for interpreting the object world that preconsciously determine our subsequent life expectations. In this sense, the unthought known refers to preverbal, unschematised early experience/trauma that may determine one’s behaviour unconsciously, barred to conscious thought. It excites me no end to see how technology is leveling the playing fields and how smart companies can really expand their business’s by taking into consideration markets that were much harder to reach not so long ago. This short video shows the world’s population centers are shifting rapidly. By the year 2100, it is projected that there will be multiple megacities with more than 70 million people – 2x the size of modern day Tokyo. The catch is you’ve likely never heard of many of these cities. Finally, Africa can really catch up if it wants to. Teri Hatcher stars in the the Housewife series, I’ve never watched an episode but I know her face. Teri was sexually abused by her uncle when she was seven years old. She started acting out and her mother’s sixth sense eventually kept her away from her uncle but no one spoke about it. Not a word or a question, just silence. Fast forward to when Teri is in her 30’s and is in her home town helping her parents pack up their home she reads an article in the newspaper about a teenage girl who had wrapped a towel around her head, to avoid a mess, and shot herself, leaving a note saying Teri’s same uncle had sexually abused her for a long time. Finally Teri was confronted with the option to stay silent or speak up and help. Thankfully she called the DA who managed to, along with other stories convict her uncle. Honestly, I don’t know if Teri is thriving today but I do know by telling the truth there’s no doubt she is running out of excuses not to be responsible for her own life. Abuse is often a life long journey of recovery and I can see from this address she made to the United Nations that she’s on the path to Thriving and no doubt, helping others along the way. “I am simply one of three women who is forced to accept violence as a part of their life story. I am one of three women who for the rest of her life battle the voice in her head that accepts blame for the abuse, a voice that is antithetical to self-esteem, self-worth, and happiness. This is a statistic that has to change. One in three women can no longer have to face the stigma and fear that prevent them from seeking help. One in three women should NOT feel afraid to come forward and report it, as they so often do because they think they will not be believed or taken seriously. When society shames the victim by asking, ‘Why did you stay?’ or ‘Why didn’t you say something?’ instead of asking, ‘Why did HE abuse her?’ we just continue to foster a society where the abusers continue to abuse. It seems no matter where we look right now people are talking about the documentary Leaving Neverland. I’ve not seen it yet, despite trying really hard to buy it online, but I do have a million thoughts running around my head. Today I stumbled across this interview with ‘Good Morning Britain’ and had to share it despite not yet being able to formalize or articulate all those millions of thoughts and feelings I have about this. To me, it felt like Piers was trying too hard to prove Dan Reed wrong. I wanted to shout out at Piers and ask him what would equate to hard evidence to him? This is always at the root of sexual abuse, how do you prove it? Last week I was reminded of my favorite way to evaluate whether a decision I’m making is a yes or a no. A kid of addicts Veronika Scott was brought up to mess up! At college, Veronika developed a coat that turned into a sleeping bag as a class project. Whilst making many versions of this ‘coat’ she was told that people needed jobs not just coats and so Veronika at the age of 20 set off to create a just that. Now, age 28 “The Empowerment Plan hires women ONLY from homeless shelters. Like Veronika said: “I was the only person that could create THIS opportunity for myself.” just love this women’s drive and a reminder to me that if it does not exist I can create it. and just incase you want to hear more or like me and just have to know the back story here’s her TEDx 10 min story. A long time ago I read this book called “Fire and Water, the power of passion, the force of flow” by Mike Lipkin and Reg Lascaris. Both well known South African individuals. In that book I learnt to question when I use the word BUT. The idea, as I remember it, was learning how to pay attention to our own negative speak. After all the first person we have to learn to communicate with is ourselves. 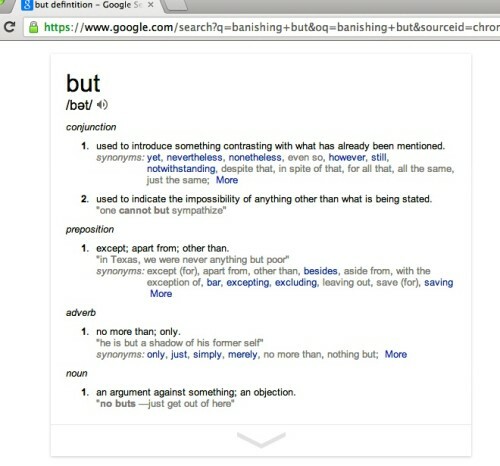 They go on to say that ‘BUT’ should be banished from our vocabulary when we are communicating our feelings with another person. They called ‘but’, the eraser word because it erases anything that may have preceded it. The solution is to replace ‘but’ with ‘and’. ‘And’ builds on what we have just said, it doesn’t wipe it all out. used to introduce something contrasting with what has already been mentioned. on the contrary; in contrast. used to indicate the impossibility of anything other than what is being stated. used to introduce a response expressing a feeling such as surprise or anger. used after an expression of apology for what one is about to say. without its being the case that. except; apart from; other than. used with repetition of certain words to give emphasis. an argument against something; an objection. Horse riding as a child was where I sorted things out in my head and my heart. I’m not certain I was aware of that at the time but in hindsight, I am certain that my horses provided me with a lot more than a safe space and, I know they were smarter than I was. Now despite my joy at being back in the saddle I am finding it very hard and super tiring, so when I discovered this brave and inspiring human it literally stopped me in tracks. 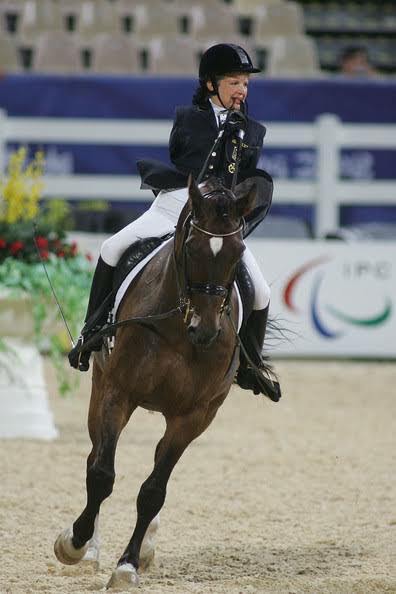 Bettina Eistel rides with no arms, AND, she doesn’t only ride and groome her horse, Fabuleax 5 with no arms or hands, she competes with him! Born in germany in 1961 with no arms due to the drug, Thalidomide, Bettina’s Mother never allowed her disability to be a disability. As a child Bettina learned how to use her feet and toes as hands and fingers. With time she started horse riding lessons. Wearing riding boots with cut-outs in the toes so she could have ‘hands’ to feel more, just imagine that for a second? Bettina can saddle, bridle, hose down, wrap a blanket and do just about anything else that is needed for her horse, Fabuleax 5. She rides by steering with her legs and holding the reins in her mouth. In addition to all this Bettina can write, text and put on her mascara on with her toes! It’s important to consider the type of horse that Fabuleax 5 must be as a partner. Together they perform at a very high level in dressage. I’m so curious to know the back story in finding Fabuleax 5? 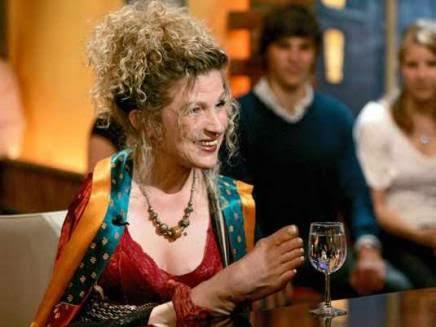 As if Bettina’s life is not full enough, she is also a Talk Show Host. With a weekly show on the German TV station ZDF. I’m in awe of this women’s courage and will be drawing on her guts, coupled with memories of my own childhood, during my weekly riding lessons from now on. The world needs this movie. It’s a fable written by a phycologist, about a psychologist. Hector is very good at treating patients, but he can’t seem to do much for those who are simply dissatisfied with life, it starts to depress him. So he takes a trip around the world to learn about what makes people happy and sad. Listing his observation about the people he meets along the way as he journeys around the globe and into the human soul. There’s so much to love about his travels and his insights. He reads a quote at the end that sums up the film. “Kindness” covers all of my political beliefs. No need to spell them out. I believe that if, at the end of it all, according to our abilities, we have done something to make others a little happier, and something to make ourselves a little happier, that is about the best we can do. To make others less happy is a crime. To make ourselves unhappy is where all crime starts. We must try to contribute joy to the world. That is true no matter what our problems, our health, our circumstances. We must try. I didn’t always know this, and am happy I lived long enough to find it out. hi, i'm tanya monteiro a starter. builder. curious adventurer. lover of colour, online marketing & innovation. always asking...are you Thriving or Surviving? Copyright © 2011 Are you surviving or are you thriving?. All rights reserved.